PANDORA addresses the dynamics of the spreading of a Pandemic and experiments are on-going on H1N1 influenza A virus by a joint simulation project involving USA, European and Australian R&D Centers (MISS DIPTEM, Dartmouth College, CRiCS). 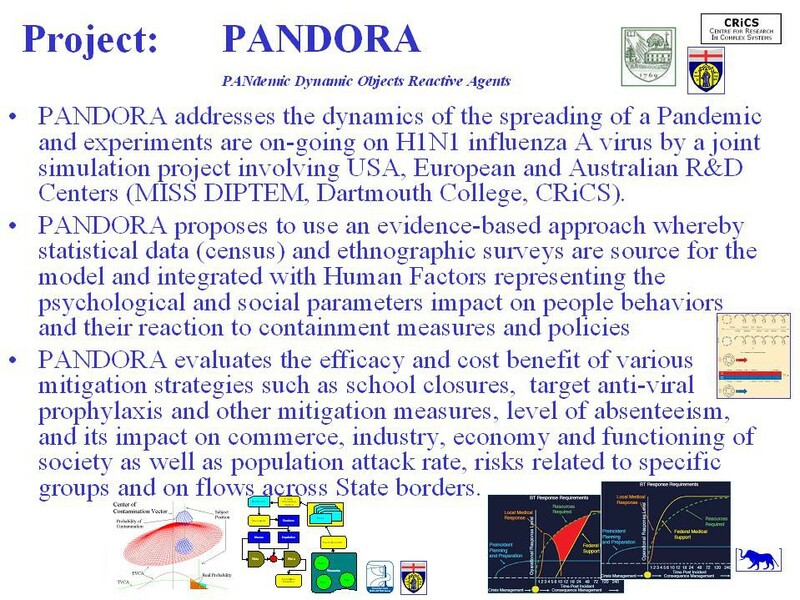 PANDORA proposes to use an evidence-based approach whereby statistical data (census) and ethnographic surveys are source for the model and integrated with Human Factors representing the psychological and social parameters impact on people behaviors and their reaction to containment measures and policies. PANDORA evaluates the efficacy and cost benefit of various mitigation strategies such as school closures, target anti-viral prophylaxis and other mitigation measures, level of absenteeism, and its impact on commerce, industry, economy and functioning of society as well as population attack rate, risks related to specific groups and on flows across State borders.